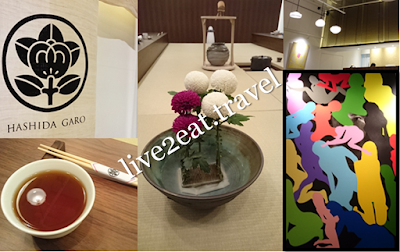 Tokyo's Hashida is headed by Master Sushi Chef, Tokio Hashida while its 1st restaurant outside Japan is helmed by his son, Chef Kenjiro Hashida. Better known as Hatch (pronounced as Haa-chi), he has since opened a 2nd establishment in Singapore to reach a wider audience with his culinary creations and share his personal passion for the visual arts. Both are located at Mandarin Gallery – Hashida Sushi on the 2nd floor and Hashida Garo on the 4th. Though the latter is a place where desserts meet art, main course is also offered as part of its set menu served with Wagashi of the day and hand-picked Japanese tea of the day. These are, however, only available during lunch and dinner times and the first-flush-tea harvested once a year is not refillable. Garo means gallery in Japanese and this "unique multi-faceted space aims to hold a visual and gastronomic feast for the senses through a creative amalgamation of food with art". As my dining companions and I were there for dinner on a weekend a few months back, the menu may have changed since. I ordered a Chicken Karaage Set consisting of deep-fried chicken thigh meat, chawanmushi and pickles. 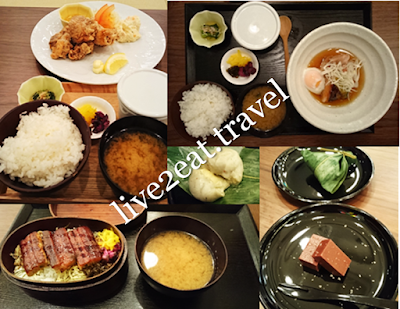 One dining companion had Buta Kakuni Set – braised pork belly with poached egg and chawanmushi while another ate Unagi Ippon (grilled eel with shredded egg and seaweed, pepper and takuan pickles). All were served with rice and miso soup we could not fault. The well-marinated chicken was crispy on the outside with succulent and tender insides. No complaints about the well-executed pork belly, grilled eel and smooth Chawanmushi too. For sweets of the day, we requested to try Chocolate Yokan and Fu Manyju which the friendly staff politely obliged. Taste of the 70% Valrhona chocolate was more prominent than red bean paste in the former though would prefer not to have the dash of sea salt from France in my thick, jellied dessert. Silky-smooth Fu or wheat gluten, stuffed with sweet white bean paste and yuzu I could hardly discern, was steamed inside a fresh bamboo leaf that gave the latter its aroma.